Monetary policy effect on Macroeconomics Monetary policy is the method by which the government, central bank, or monetary authority controls the supply of money, or trading foreign exchange markets. This policy is usually called either an expansionary policy, or a contractionary policy. An expansionary policy multiplies the total supply of money in the economy, and a contractionary policy diminishes the total supply. 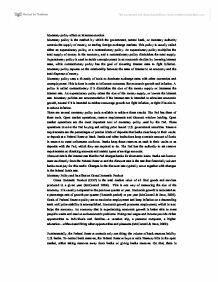 Expansionary policy is used to tackle unemployment in an economic decline by lowering interest rates, while contractionary policy has the goal of elevating interest rates to fight inflation. Monetary policy reposes on the relationship between the rates of interest in an economy and the total dispense of money. Monetary policy uses a diversity of tools to dominate exchange rates with other currencies and unemployment. This is done in order to influence outcomes like economic growth and inflation. A policy is called contractionary if it diminishes the size of the money supply or increases the interest rate. An expansionary policy raises the size of the money supply, or lowers the interest rate. Monetary policies are accommodative if the interest rate is intended to stimulate economic growth, neutral if it is intended to neither encourage growth nor fight inflation, or tight if its aim is to reduce inflation. ...read more. Fundamentally, the Federal Reserve controls only one thing; the volume of bank reserves held by U.S. banks. To control bank reserves, the Federal Reserve buys or sells Treasury bills in the open market, either taking reserves away from banks or giving banks reserves. On that, there is basically no choice. Measuring GDP is complicated but the calculation can be done in one of two ways: either by adding up what everyone earned in one year (income approach), or by adding what everyone spent (expenditure method). Both measures should arrive at approximately the same total. A significant change in GDP, up or down, usually has a significant effect on the stock market. It's not hard to understand why: a bad economy usually means lower profits for companies, which in turn means a decrease in stock prices. Growth lessens the burden of scarcity (McConnell & Brue, 2008). Monetary Policy effect on Unemployment When the economy is healthy, you will generally see low unemployment and wage increase as businesses demand labor to meet the economy. Monetary policy has two basic goals: to promote "maximum" output and employment and to promote "stable" prices (Money 2008). Since the Fed cannot control inflation or affect output and employment directly it makes and impression indirectly, through raising or lowering short-term interest rates. ...read more. However, unemployment rates in the intermediate range are usually difficult to interpret (Money 2008). There are two types of inflation: Demand-pull Inflation and Cost- push Inflation. Interest rates Monetary policy causes an increase in bond prices and a decrease in interest rates. A free market rate of interest is a composite of three factors: the originally rate of interest, the risk premium, and the price inflation or deflation (rare since 1933) premium (North 2006). Conclusion It is amazing at how little we know about where our money goes or comes from. Many people are content with the simple knowledge that our money goes in our banks of choice. However, things are not as simple as they seem. Our money goes somewhere and it affects us all where it ends up. It is obvious that everything is interrelated. Every decision made has an impact on the bigger picture. Monetary policy can have a positive as well as a negative effect on everyday people. This can be manifested primarily through a shift in employment status. The government, however, has many tools in order to help the situation. These tools at time can improve or even deteriorate the dilemma. They are made to bring the economy out of crisis. But there is no doubt that monetary policy has a tremendous effect on macroeconomic factors as GDF, unemployment, inflation, and interest rates. ...read more. (Rs.in Million) 2004-2004 2004-2005 Classification Budget Revised Budget Housing and Community Amenities 821 926 832 Community Development 821 926 832 HEALTH AFFAIRS AND SERVICES Under Health Affairs and Services a total allocation of Rs 3254 million in the budget estimates 2004-2005 have been provided. The government may use fiscal policy by varying the level of its expenditure and/or its tax revenue to influence the behaviour of the economy. Fiscal policy can be implemented on three distinct areas4: 1. Policies related to the purchases of goods and services by the government. 2. Inflation as measured by CPI&GDP deflator has been approximately 1-2% for the last 2 years. Inflation has been defined as a process of continuously rising prices or equivalently, of a continuously falling value of money. Various indexes have been devised to measure different aspects of inflation. 6.2 Factors of the Trend of Immigrants in Malaysia 6.2.1 Economy Malaysia is the focal point of immigrants from Nepal, Bangladesh, Vietnam, Indonesia, India, Pakistan and Philippines as Malaysia has a fairly strong economy compared to the neighbouring countries. They can get higher wages back to their country to escape poverty and support their family. 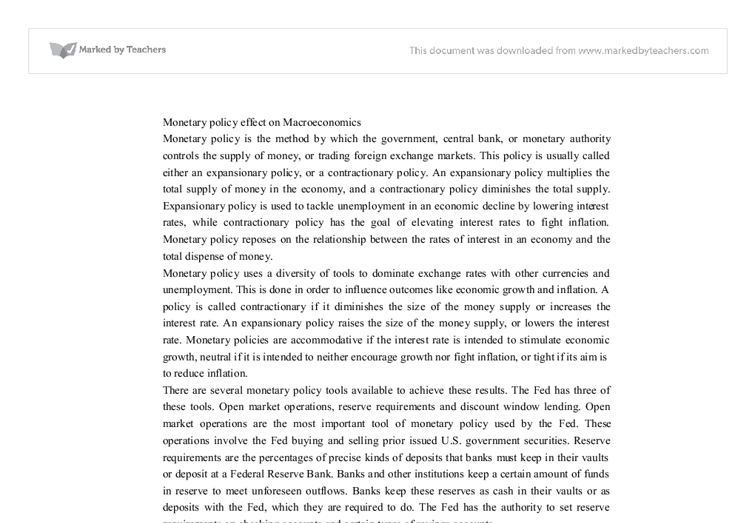 Monetary Policy According to McConnell & Brue, monetary policy ?consists of deliberate changes in the money supply to influence interest rates and thus the total level of spending in the economy? (2004, p.268). The deliberate changes that the Federal Reserve institutes alter the reserves of commercial banks through three tools: the Discount Rate, the Reserve Ratio, and open-market operations.